Positively-BobDylan.com presents the all-new tweedlr.com: Visit the web's first Bob Dylan-only song rating and song discussion platform. It's free and independent. Rate and post comments on over 1,200 original Bob Dylan tracks from 66 official album releases. Already more than 30,000 songs ratings have been submitted. 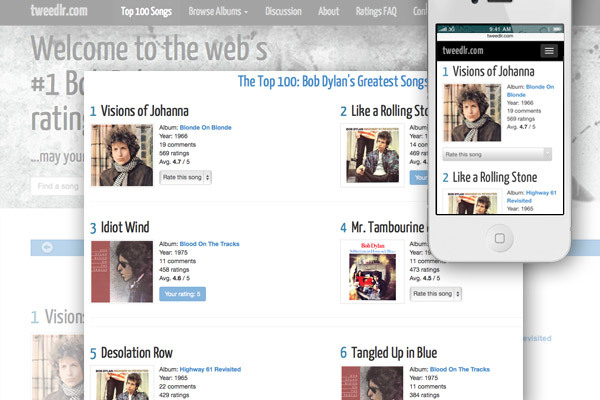 Join 2,000 other tweedlr.com users and Bob Dylan fans around the globe. You can rate songs directly on the song and album pages, without signing in or registration necessary. The better you like a song, the higher your rating value should be. Choose from the following options: 5 (masterpiece), 4 (great), 3 (good), 2 (average), or 1 (miss). When you view an album or song page, you will see a "tweedlr stars" rating. This is an additional automated song rating based on various criteria, such as the total number of ratings for each rating value of this song. The tweedlr stars rating is always relative to all other rated songs, so it changes every time a new rating is submitted. Also, the more high ratings a song receives the more stars is will get. The more low ratings a song receives the more stars will be substracted. All in all it's a rather complex process, but it shouldn't bother you. In autumn 2013 tweedlr.com has been completely redesigned, now you can even rate your favorite songs on your smartphone. The name tweedlr was inspired by Bob Dylan's "Tweedle Dee & Tweedle Dum" with an intentional little Web 2.0-ish misspelling.